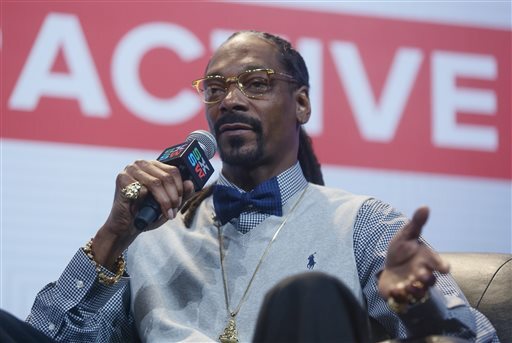 AUSTIN, TX—No one who knows the name will be surprised to hear that Snoop Dogg started late when delivering the keynote address Friday morning at SXSW 2015. By his own admission, he prepared for his chat with manager Ted Chung by sparking up backstage. Marijuana is still illegal in conservative Texas, fo shizzle. But Snoop could not care less, and that was only one of many charms he displayed during a relaxed 45-minute talk that hit on his musical awakening (listening to records his mom played at parties, like Curtis Mayfield and Al Green, but also “the ones I wasn’t supposed to listen to,” like Richard Pryor); the damage Reaganomics did to his hometown of Long Branch in Southern California; his new hobby of abstract painting; giving back to the community via his youth football league, and of course a bit of hype for his upcoming projects, including an HBO series about Long Branch when he was growing up directed by Allen Hughes (Menace II Society, The Book of Eli) and a new album called Bush produced by Pharrell Williams and due in May. Squaring the affable and accomplished fellow onstage with the public menace described by preachers, older artists, and other guardians of public morality early in his career—“like I’m the worst black man ever created,” as the rapper said—was impossible. But then he didn’t hit upon more troubling aspects of his story or legacy, such as his many brushes with the law or his undeniably demeaning to women videos. What advice did the thousands of aspiring young musicians at SXSW take away from the session? Well, there wasn’t any. But the conference has long since moved from keynotes that actually address the reason for this event to bursts of not-really-keynotes-at-all celebrity-entertainment interviews. And Snoop was nothing if not entertaining. Much of my afternoon was taken up by a panel I sat on called “Should Music Mags Survive or Get Killed Off?” (previews here and here; my answer: Depends on the magazine!) and phoning in a radio report to Justin Kaufmann, guest-hosting WBEZ’s The Afternoon Shift one more time before riding off into the sunset (god speed, amigo!). But I made it back to the convention center in time to catch the artist who may be the single biggest buzz of the conference, Courtney Barnett, performing on the Radio Day Stage. Like Remi, the rapper I wrote about earlier, Barnett hails from Melbourne, Australia. She began turning heads in the States after a series of EPs and some impressive performances at the CMJ Music Marathon in 2013 highlighted her searing guitar playing, impressively sophisticated songwriting, and often ferociously funny lyrics, but she absolutely owned SXSW. The late Friday afternoon show was her eighth and last of the conference, and she took the stage just a few hours after playing outside in the rain earlier in the afternoon, fronting a vice-tight trio. Whatever her real feelings toward her fans, they certainly adored her. Someone had brought an inflatable kangaroo and perched it on the edge of the stage, and after her bassist tossed it into the crowd midway through the set, it was bounced overhead like a beach ball as she continued to deliver one churning number after another, evoking a young Patti Smith as a Seattle rocker circa 1992, or perhaps Joe Strummer crossed with the more focused, early-Hole Courtney Love, only without the mean streak and more self-effacing. My rain-soaked final night at the fest ended with two fine psychedelic-rock bands. The first, Ultimate Painting, is a London-based group led by Jack Cooper and James Hoare that specializes in gently lilting, somewhat melancholy, but generally expansive and quite lovely pop songs. Their self-titled debut was released last October, and it just jumped to the top of my play list. Dutch multi-instrumentalist and producer Jacco Gardner mines similar but spacier turf; as the fan who turned me on to him said, think of the Zombies crossed with More-era Pink Floyd. A new album called Hypnophobia is due on Polyvinyl in May, and I can’t wait. My only disappointment of SXSW 2015? I wasn’t able to get up and out in time to catch the Bright Light Social Hour, another brilliantly melodic and delightfully airy psychedelic-pop band, playing a radio gig at the ungodly hour of 8 a.m. Friday. The group, an Austin band comprised of actual Austin residents who just released their second album Space Is Still the Place via Frenchkiss, did not have an official SXSW showcase. But, hey, there’s always next year! SXSW Dispatch #2: Soak, Girlpool, Remi, Blossoms… and Frank Sinatra? And listen to Sound Opinions next week for more at SXSW 2015 from Greg Kot and me.